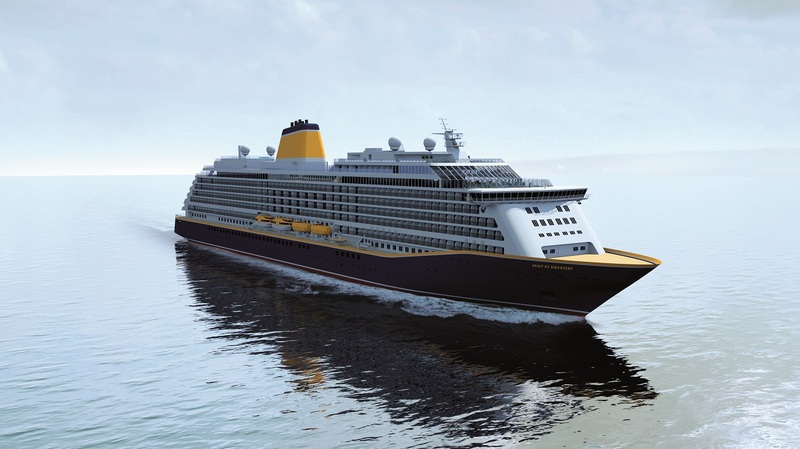 The countdown has begun for Saga Cruises’ brand new ship. Launching in summer 2019, Spirit of Discovery heralds a new era for the company. The boutique vessel, which carries no more than 1,000 passengers, will offer the chance to experience so much more. One will be able to explore the world, taste the local food, and really experience the local culture. All from the comfort of a balcony cabin, and backed by Saga’s famous personal service and inclusive value. From bow to stern, every aspect of the ship has been designed to surprise and amaze. With design cues inspired by some of the world’s finest hotels, she will be spacious and contemporary, and packed with places to get active, relax and indulge. It’s going to be a distinctly British cruise experience – there’s simply not going to be another ship like it. Spirit of Discovery will offer Saga’s widest ever selection of restaurants at sea, led by an expert team of executive chefs. Whether you choose to eat in the Grand Dining Room or any of the speciality restaurants, all meals will be in included in the cruise fare – along with a choice of house wines. Talking to its loyal customers and past cruisers, Saga learned that getting to taste the authentic flavours of the world is every bit as exciting as exploring the destinations. The classic surroundings of this magnificent double-height room will be the venue for the finest a la carte cuisine at breakfast, lunch and dinner. It will offer open seating and is large enough to accommodate all passengers for dinner at a single sitting. The Dining Room will also host the greatest of all cruising traditions – a grand afternoon tea, freshly prepared and served each day. With separate spaces to eat both inside and in the open air, the Verandah and Grill will be two restaurants in one. The space will offer a delicious help-yourself buffet at lunchtime, while in the evening, waiters will serve dishes cooked to order. Chefs will work in an open show kitchen, adding to the theatricality of the venue, as they prepare a range of tasty meals – often using locally sourced produce. 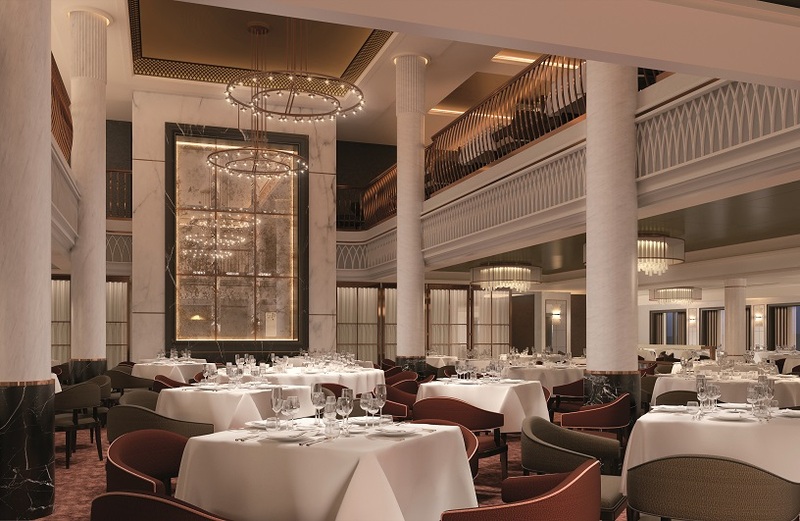 There will be an emphasis on healthy eating and the Verandah and Grill has been designed to provide a casual, relaxed fine-dining experience with the same outstanding levels of world-class cuisine available throughout the ship. The outside area of the Verandah and Grill will have the same menu choices but with the added benefit of dining al fresco. There will also be barbecue stations providing freshly grilled fish, meat and vegetarian plates. An elegant garden area and the perfect outdoor drinking spot. From The Terrace guests will be able to enjoy the fresh, sea air at any time of the day. It’s likely to be especially popular after dinner, as guests sip cocktails while watching the sun go down. 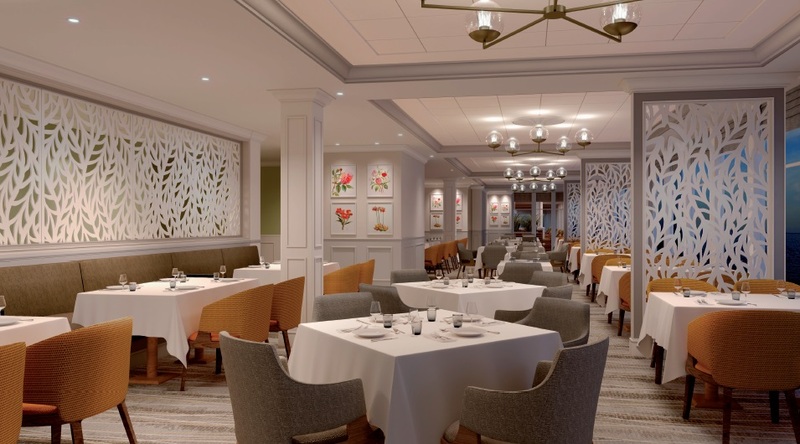 The Terrace will offer easy access to Spirit of Discovery’s full-length wraparound Promenade, a byway that encircles the ship. A huge success on Saga Sapphire, East to West offers something different for dinner. 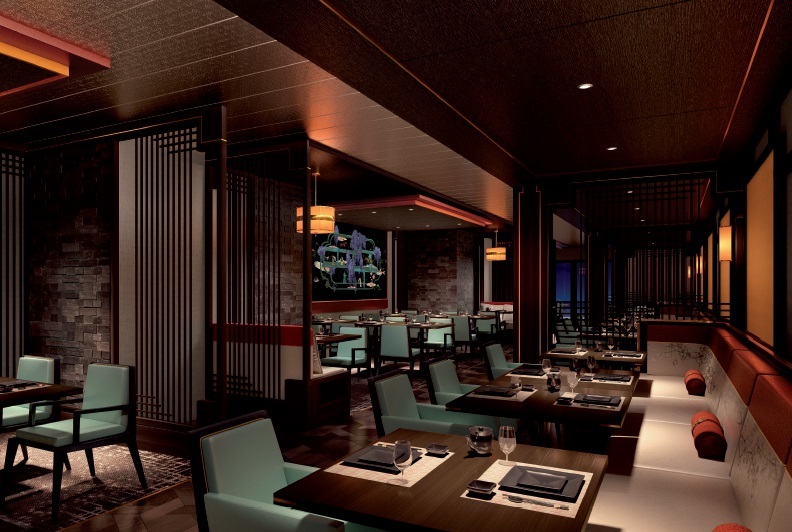 This exciting Asian-themed venue has a frequently changing menu to tickle the tastebuds with the flavours of the Orient. Chefs bring impeccably presented dishes to the table, full of the diversity and vibrancy of Asian cuisine, from classic favourites to those with a contemporary twist – such as sizzling beef fillet in a Balinese sauce, and blackened tilapia with fennel. A first for Saga, this is Spirit of Discovery’s seafood speciality restaurant, serving British and locally sourced fish, shellfish, and the full panoply of fruits de mer. Offering a modern seafood dining experience every evening, Coast to Coast focuses on simple, elegant cooking that allows the ingredients to speak for themselves. Whether you want the Catch of the Day simply grilled or pan-fried, or have a palate for more adventurous dishes such as ceviche, all will be on the menu. Aboard Spirit of Discovery, a selection of house red, white, rose and sparkling wines will be available at each meal. In addition, there will be a handpicked connoisseur selection to purchase by the glass and by the bottle. In addition, there’s a selection of UK-sourced craft beers and ales, not forgetting a trendy gin trolley. In a tribute to Saga’s cruising heritage, the ship’s main bar has been named after a venue on Saga Ruby. Styled like a high-end hotel bar, the South Cape Bar is the perfect place to meet friends, relax with a drink and to unwind after a busy day in port exploring another amazing destination. The bar will also be used to show the occasional live sporting event on its large TV screens, along with a programme of evening entertainment. The hub of the ship will be the bright and inviting Living Room, a vibrant, social venue which is the place to meet friends, grab a coffee, go shopping, or relax with an after-dinner cocktail. Open day and night, it will serve ice cream, fresh pastries and homemade cakes – all on the house. As the evening arrives it transforms into a Champagne bar and is open late. Looking to indulge with some seductive pampering? Spirit of Discovery’s serene spa will be the perfect haven, the perfect place to relax and re-energise. 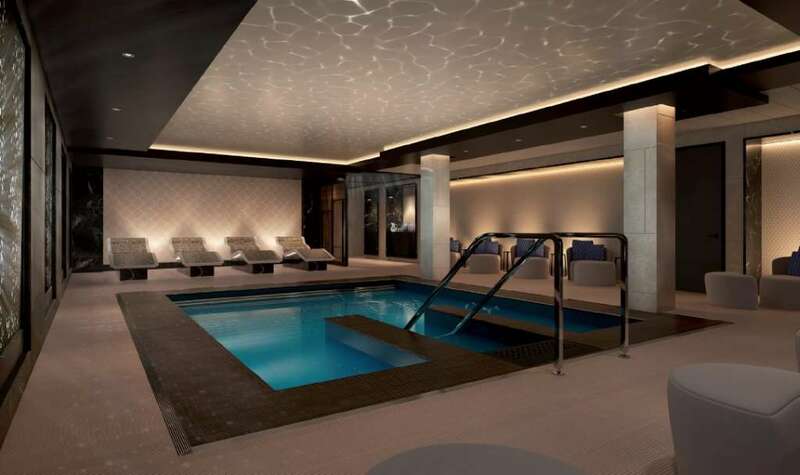 Step inside and find an inviting hydrotherapy pool located beside a steam room, infra-red sauna, and five private areas for a selection of indulgent treatments. It’s another aspect of the ship’s healthy living programme that will also include a cutting-edge gym, classes for Pilates, yoga and Tai Chi, and one-to-one sessions with fully trained fitness experts. Spirit of Discovery’s surprises continue in another exciting first for Saga – a 400-seat theatre with a raked auditorium guaranteeing that every guest has the best seat in the house. Each evening will bring a colourful new show from the ship’s very own theatre company, live music, guest entertainers, comedians and magicians, cinema screenings and much more. With the feel of a cosy coffee shop, The Library will have an extensive selection of fiction, non-fiction, and reference books. It will be the perfect place to research the next port of call, and to catch up with family and friends back home via emails and social media. Better still, the open kitchen area means guests can help themselves to complimentary tea, coffee, and a slice of homemade cake. The adjoining craft area hosts a range of free classes and workshops, perfect for those wanting to learn a new skill to enrich their cruise experience. Next door is the ever-popular Card Room. With an average floor planof 245 square feet, the ship’s cabins will offer plenty of space, styled to showcase the best in contemporary, yet classic, British design. 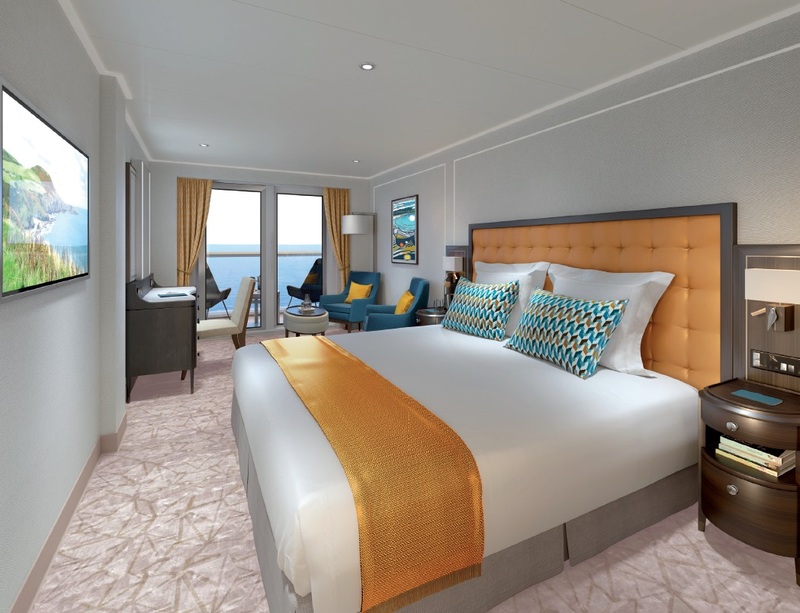 Each cabin will have a balcony – so whether you’re in the heart of a Norwegian fjord or sailing around the sunny Mediterranean, you’ll have your own place to relax and thanks to 24-hour room service, to dine al fresco at no extra charge. Single passengers will be spoilt for choice, with a range of more than 100 cabins in various grades. All standard cabins include twin, double or single beds; private balcony; private bathroom and WC and shower; complimentary wi-fi; 24-hour room service; fresh fruit basket and nightly turndown service. There’s even more luxury available for passengers who upgrade to suite accommodation. Offering far more personal space – up to 730 square feet per cabin – they feature living and dining areas with elegant sofas and bespoke furniture, while the en suite bathroom will impress with twin washbasins, shower, and separate whirlpool bathtub. Suite guests receive butler service, a daily newspaper, continental breakfast wake-up tray, pre-dinner canapés, in-cabin afternoon tea service, and an espresso coffee machine. The highest-grade accommodation on Spirit of Discovery is to be found in the top Forward Suites. Each one has been individually designed to be a one-off, signature space that will be the epitome of true luxury and elegance at sea. These are grand, opulent spaces, they will have real character. The bespoke artwork and high-end fabrics, furniture and fittings ensure they are among the finest cabins afloat. The world of cruising is constantly changing and evolving. And Saga knows that what guests do when they step off a ship is just as important as their time on board. This is why Spirit of Discovery will feature the brand new Explore Ashore concept. Guest Services will be located close to Spirit of Discovery’s Living Room. Here, travel experts will be on hand to help plan those perfect days and evenings ashore. Whether the guest is looking for a one-off adventure tour, is happy to grab a map and go freestyle, or if they want to browse the comprehensive list of available shore excursions – all options are available. The team will also be happy to provide independent travel advice free of charge. The bespoke concierge service heralds a new way to plan and enjoy time ashore, tailored to each individual guest’s requirements. Exclusive small-group tours to local hidden gems that won’t be found online or in guidebooks – such as access to private rooms in state buildings and museums in Estonia and the Caribbean. Hands-on food experiences in Barcelona, where you’ll meet local chefs, buy fresh produce, then cook and eat regional dishes – for an unforgettable real taste of the area! Choose two highlights in a destination, perhaps two art museums in Italy, and we’ll arrange a private driver to take you there, stopping at lunchtime at a top eatery close by. Attend intimate concerts from local musicians and orchestras, before getting a backstage glimpse of life behind the scenes. Set off for private hikes and walks, flightseeing tours, boat trips, railway journeys and wildlife safaris in destinations from Arctic Norway to the Canary Islands. Exclusive encounters with painters, sculptors and local artisans across Europe.